Throughout December we have been receiving deliveries of our new-look labels, glassware, pump clips and beermats to the brewery and we are delighted to be rolling out our new website which is the final stage of our overhaul. 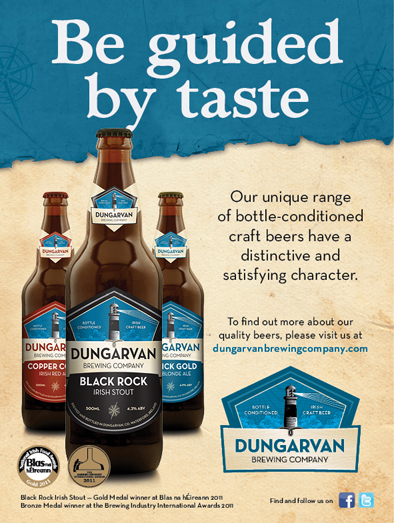 We decided in early 2012 that it was time to look at our branding and image — since we launched in 2010 the micro-brewing scene has exploded in Ireland with new breweries and bottled beers appearing more and more frequently. When we were first designing our labels we felt we needed to go with a safer, more sedate image as Irish craft beer was such a different concept to the Irish drinkers, but we felt the time is right now to bring our image on a level. We were adamant about maintaining our original lighthouse insignia (based on Mine Head lighthouse in Old Parish) but wanted to otherwise revamp the labels. We are delighted with the finished product and feel they are very worthy of the fantastic beers we are putting inside them. Last Monday we gathered with a few friends and colleagues in Merry’s Gastropub in Dungarvan to toast the new look and I’d like to say a big thank you to all those who came out to meet us on the night. Rest assured, it is only the outside changing; the beers remain the same quality product we’ve always brewed. Big thanks to everyone involved in getting us to this stage, including all those who have been enjoying our beers for the last two and a half years – here’s to next year and what may be in store for us all.